Symptoms of avian heart attack may be subtle, or they may be sudden and devastating. Birds who are advanced in age or overweight are prime candidates for heart disease; females also are at greater risk for heart attack. Heart attack in birds is sometimes difficult to diagnose due to its many symptoms. If a bird's owner suspects his feathered friend is having a heart attack, a veterinarian should be consulted with immediately. Doctor examining woman's pet bird. Birds who are weak or lethargic are in need of immediate veterinary attention, according to the Bird Channel. 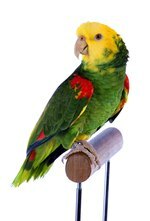 The bird may be sluggish or inactive for a period of time, or may sit at the bottom of his cage with his feathers fluffed out. Lethargy itself usually indicates that the bird is in the final stages of a serious illness. A bird who is lying on the floor of his cage and is too weak to rise also needs his vet as soon as possible, as the weakness may be due to a heart attack. As heart disease advances, birds may exhibit discoloration of the skin near their eyes due to low blood-oxygen levels, according to the Bird Channel. This is due to the heart's increased struggle to deliver blood to the body. Called cyanosis, this condition also may occur when the bird contracts a respiratory infection or ingests poison. A trusted avian veterinarian should be consulted as soon as cyanosis appears so that the diagnosis can be made and the bird can receive the appropriate medical care. Though a swollen abdomen may be the sign of many avian health problems including egg binding, obesity, tumors and organ enlargement, it also may be a telltale sign of avian heart attack. Fluid that accumulates in the bird's abdomen can be collected by the veterinarian and tested in a lab, according to the Melbourne Bird Clinic. The nature of the abdominal fluid will help the veterinarian to diagnose the bird's condition and to prescribe an appropriate treatment. Exercise intolerance may be a sign of obesity, which can lead to heart attack. A bird who easily becomes tired after a brief wing-flapping session may be overweight. A consultation with an avian veterinary professional may serve to allay a bird owner's fears. The veterinarian will use his fingers to palpate the bird's body, including the bird's pectoral muscles, where excess fat is stored. Overweight birds exhibit a bulge on either side of their keel bone. According to Avian Medicine, a regular flight regimen and balanced diet will prevent obesity.